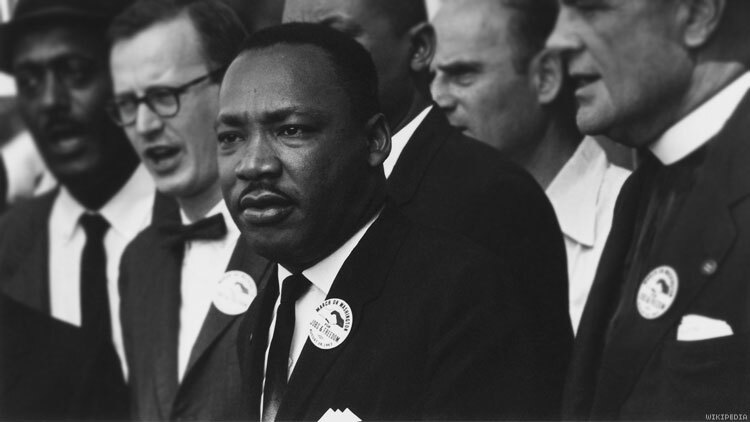 How Can You Live Up to Martin Luther King's Dream? Fifty years after he was taken from us, we're still trying to make his "beloved community" a reality. This year is the 50th anniversary of the assassination of the Rev. Dr. Martin Luther King. It’s a painful and necessary anniversary to remember, especially considering where the country is today. Americans on the margins have the most to lose in a nation now eroding if not dismantling decades-long civil rights gains that allowed full protections and participation in an evolving multicultural democracy. While I am nervous abpit where we are in 2018 after an Obama presidency, I am also reminded, however, of MLK and the civil rights movement of the 1960s. My looking back at that era gives me hope to look forward beyond this moment. During the time of King’s dream of “Building the Beloved Community,” Southern states had long systematized a peculiar brand of justice with their“separate but equal” laws that allowed for separate drinking fountains, restrooms, restaurants, hotels, to name a few. The South during the civil rights movement was a place where the entire country could watch African-Americans being subdued by gushing water hoses or being charged by aggressive German shepherds on national television. And at night, when no one was watching, the Ku Klux Klan rode through black neighborhoods to burn their property and/or them, brandishing fire and terror as symbols of white supremacy. However, racism did not just situate itself unabashedly in the South, it also tainted life in the North for African-Americans, albeit differently and less visibly. And although segregationist practices directly violated the Fourteenth and Fifteenth Amendments to the U.S. Constitution, the federal government exerted little to no effort to enforce these amendments — in either North or South. Our job in keeping King's dream alive is to be part of a participatory government — local and national — that is feverishly working to dismantle all existing discriminatory laws and practices that truncate full participation of its citizens in the fight to advance democracy. Cambridge, Mass., is my community, but it falls short of King’s dream. Cambridge, proudly dubbed “The People’s Republic of Cambridge,” is ranked as one of the most liberal cities in America. And with two of the country’s premier institutions of higher learning — Harvard University and Massachusetts Institute of Technology — that draw students and scholars from around the world, Cambridge’s showcase of diversity and multiculturalism rivals that of the United Nations. Cambridge is no doubt a progressive city. However, when you scratch below Cambridge’s surface, there is also liberal racism that is as intolerant as Southern racism. Just like Southern racism that keeps blacks in their place, liberal racism doe, too. For example, Cambridge’s liberal ruling class maintains its racial boundaries not by designated “colored” water fountains, toilets, or restaurants, but rather by its zip codes; major street intersections known as squares, like the renowned Harvard Square; and residential border areas that are designated numbers, like Area 4 (now known as the Port), which was a predominantly black, poor, and working-class enclave that is now gentrified by the biotechnology and pharmaceutical boom. Cambridge’s liberal ruling elite exploits these tensions by otsclaims to not see race, until of course, an unknown black man appears in their neighborhood. Segregation in this city is not only along racial lines but class too. With its tony enclaves filled with homes at starting prices over a half- million dollars, Cambridge has become a city that is predominantly white and upper-class. Poor and working-class whites and white immigrants do not experience the fullness their white skin privilege would abundantly afford them if they too were part of Cambridge’s professional and/or monied class. If King were among us today, he would say that it is not enough to just look outside ourselves and communities to see the places where society is broken. King would want us to examine institutions, workplaces, and universities that separate people from one another based on race, religion, gender, class, and sexual orientation by looking at ourselves and communities made up of people like you and me. The top three concerns for Cambridge’s marginalized communities are access to quality public education, racial profiling by police and other community members, and affordable housing. How does your community measure up to King’s dream? REV. IRENE MONROE does a weekly Monday segment, “All Revved Up!” on Boston Public Radio and is a weekly Friday TV commentator on New England Channel NEWS. She’s a theologian and religion columnist.